Refugee Assistance Morris Partners (RAMP) seeks to assist vetted Middle Eastern and other refugee families to transition to productive lives of dignity, safety and hope in the Morris County area of New Jersey. You have seen the pictures. The small boy washed ashore on the beach in Turkey. Dead. The stunned child in Aleppo in the orange chair, feet dangling, covered in soot and blood. And in Afghanistan, innocent victims of a car bombing in Kabul. These are the haunting images from the Syrian and Afghanistan wars. These conflicts have caused the greatest humanitarian crisis of our time. 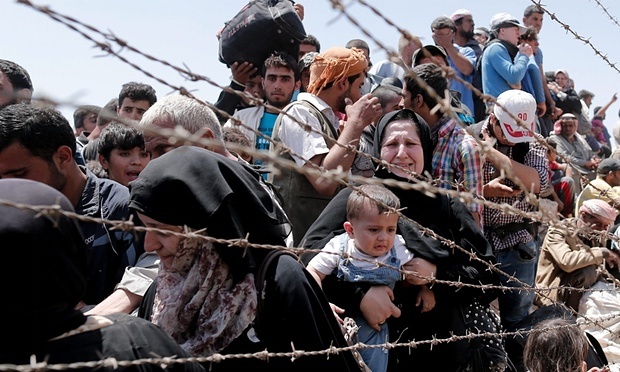 Almost nine million Syrians and Afghans have fled their countries. We hope you have also seen the stories of some of the Syrian and Afghan families who have resettled to the United States. Generous American hosts welcoming refugee fathers, mothers and children to a safe haven. And after a while, these families getting jobs, going to school and assimilating into their new country. In the spring of 2016, a coalition of Morris County area faith-based organizations came together to take action in this crisis. These were Christians, Jews and Muslims. The volunteer group is known as RAMP, for Refugee Assistance Morris Partners. RAMP is working with Church World Service (CWS), the relief arm of the National Council of Churches of Christ, to bring Middle Eastern families to the Morris County area. We are in the business of giving these families hope for the first time in many years. We want to be a bridge to assist people to cross from one life to another. RAMP provides a full range of core support services to assist the refugee families. These services include: welcome procedures; community orientation; finding employment opportunities; identifying appropriate social services; educational assistance (schools and English language instruction); transportation; and medical care. Services also include raising, managing and judiciously distributing funds, and finding and furnishing suitable living arrangements. The objective is gradual independence for each of the resettled families. Our goal is to help as many families as our volunteer resources will allow. This is a huge problem, but we feel obligated by our consciences and our faith to do whatever we can to help, however small. If you give a family in distress a safe place they can call home, you have made a difference. As of 2019 we have welcomed and supported three families, a total of 12 people. One family is from Syria and two from Afghanistan. It is so heartwarming to be part of their life stories here in the U.S. We have seen two of the families give birth to daughters in the U.S., brand new citizens. We watch with love and pride as the families learn English, get jobs, driver’s licenses, and go to school. They go from being refugees to being friends and neighbors. RAMP members include Roman Catholics, Episcopalians, Muslims, Jews, Presbyterians, Methodists, Mormons, Unitarians and United Church of Christ. Others are welcome to join. We need volunteers to welcome families, find or provide housing, and get household equipment, kitchen equipment, food and clothing. We also secure medical, dental, optical and other services, as well as transportation, tutoring in English, and instruction in other subjects as needed. Volunteers can also help families meet other people related to their religion, nationality, profession and areas of expertise. To volunteer, click on VOLUNTEER. Or you can send us an email at info@rampnj.org. We also need donations. In addition to the public support families receive, private donations are needed to help families in their first months of transition. For donations, RAMP is working as a special project fund of the Community Foundation of New Jersey. All donations are tax-deductible. Financial donations may be sent to Treasurer, RAMP, P.O. Box 1544, Morristown, NJ 07960. Checks should be made to the Community Foundation of New Jersey with RAMP indicated in the memo line. And you can contribute with a credit card. RAMP also accepts in-kind donations, especially of house furnishings and clothing. To donate, click on DONATE.